I got your comic books finally. I also got a letter from Dad and Marion. can take care of myself. Everything is going along okay. decked out like a new boot. Tell Marion that I got Ellen’s letter. I don’t have any time to write to her. I’m glad to hear that Davey likes babies. I guess he takes after the family. It rained all day yesterday & today. It washed out a couple of bridges and fouled up the roads. It’s about midnight. Wish me luck. guard) and the sound of the blue Pacific surf is like music and the moon – ah the moon is the brightest, bluest moon I have ever had the pleasure of setting me optics on. It’s nice and cool at night but the days are sure scorchers . How’s the weather at home, kid? letter what the number was. Now, really, do you have any on the string? was transferred to a rifle platoon. You may be 5 feet 7 and ¾ inches tall but your still a runt, to me. Well I guess that’s about all for tonight. Jake Hoechst who is a good friend of Fred & mine is there. He lives on Lisbon. I know that I will be at the same place with Jake. here O.K. would you give it a try, please. Also if possible some pickles and wine or some other beverage. (Nothing too strong). I’m quite fed up with field rations. After 94 days I guess I am entitled to be fed up. So are all the others. They sure get monotonous as hell. one on the south beach. There isn’t anything doing now but patrols which bring in a few prisoners, now & then. The nips are starving and thirsting now. That’s why they’re giving up. They are down in a small pocket which is patrolled every day. (After reading about the battle and speaking with some Sixth Division men, I believe the previous letter has the wrong date – it maybe should read July instead of June). This place should be secured soon and we should be on our way back to Guam. another one roles around that I will be home or at least some place in the states where I can get home. with a whole skin. But I dood it. on about April 20. He should have the letter by now. Say hello to Grandma & Grandpa for me. I guess I’ll write them a letter later. So long. Well, kiddo, it’s all over here. I hope that we will leave here soon. I have been getting your letters O.K. I just haven’t had time to answer any of them. I’m glad to see that Bick is getting some vocational training. I hope that you got by your exams alright. Did you? don’t even know if Jeanette is going there. Today I went to the dedication of the 6th Div. cemetery. It was a very impressive sight. Seeing all those crosses of the men who have died. 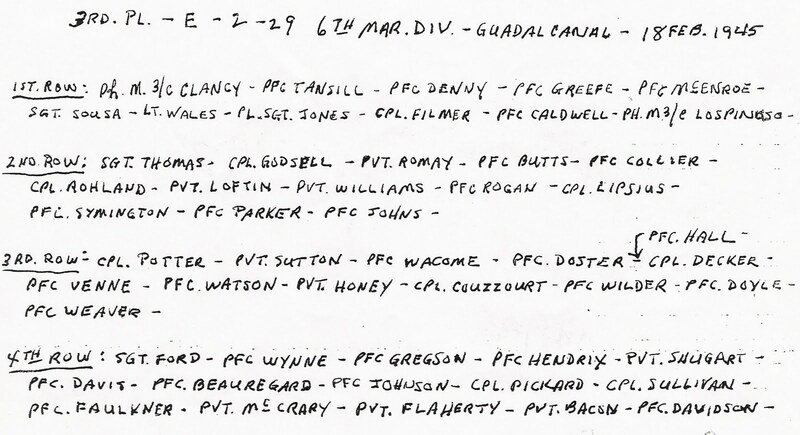 I looked over the graves of a lot of my buddies & marked their location for the rest of the platoon. I really had tears in my eyes for a while & wasn’t the only one either. leave. I was really surprised at the way the Island has been built up. I will give a brief resume of my stay here. We have finally left Okinawa. I can’t say that I’m sorry about it, either. I’m getting fat on the chow on this LST. It sure is good. the Marine Corps. We may get a couple of days off but it probably won’t amount to much more than that. I hope that you are enjoying your vacation. We are pulling in some time tomorrow. The sea has been quite rough the last couple of days. for that length of time. What are they sleeping on cots or straw ticks or what? the News and writes a note on it every week. Say hello to all the kids. Hugh C. Lipsius, of Buffalo, NY, served in the Marine Corps in the Pacific during WWII. He enlisted and went off to boot camp at Parris Island in June of 1943, just shy of his 21st birthday. He was married, had a 6 month old son, and had completed 1 semester of college at the time of enlistment. He trained at Parris Island and Camp Lejeune, attained the rank of Corporal. His primary military duty was a 60mm mortar man and as a Corporal he would have been in charge of a mortar squad. 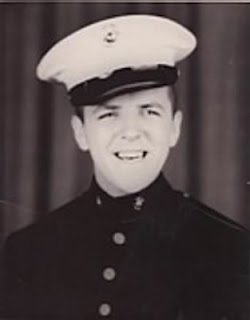 He eventually shipped out to Guadalcanal and while there was assigned to the Sixth Marine Division, more specifically he was in E Company, 2nd Battalion, 29th Regiment of the Sixth Marine Division. 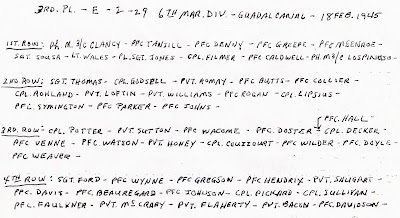 The “Striking Sixth” was unique – they are the only Marine Division to have never seen service in the USA. The Division was formed on Guadalcanal and was disbanded in Tsingtao, China. Hugh was in training on Guadalcanal from August 1944 until sometime in March, 1945. The Division was going from Ulithi to participate in the battle of Okinawa. One letter was for his mother, father and siblings, and the other letter was for his sister. 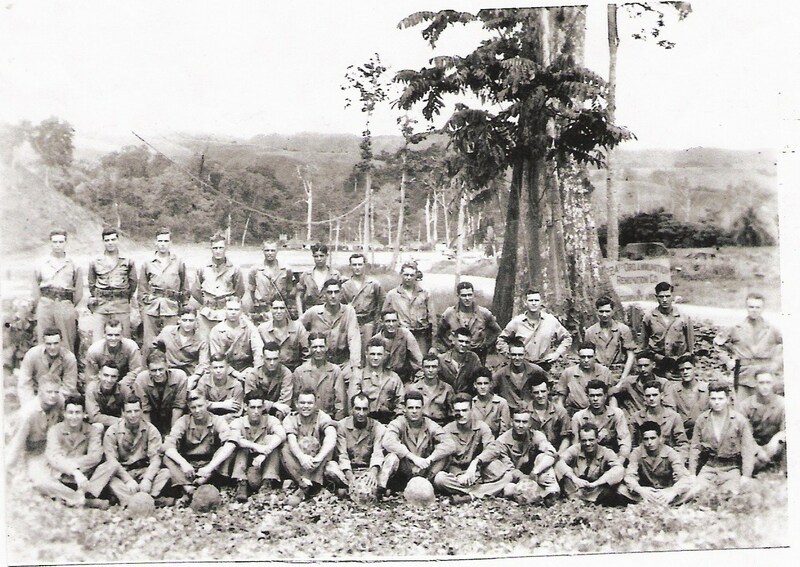 The Sixth Marine Division was sent to Guam after the battle of Okinawa. 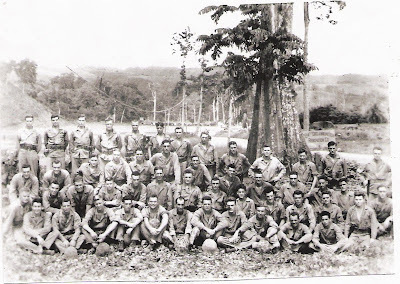 They were on Guam to begin preparing for the invasion of Japan. After the Atomic bombs were dropped and Japan surrendered, the Sixth Marine Division was sent to Tsingtao, China to assist with repatriating Japanese and Koreans. Hugh was in China until sometime in December of 1945, was sent back to the states at this time and was honorably discharged in January of 1946. Hugh C. Lipsius had a son, who was Killed in Action, in Vietnam. Click Here to read his son's last letter to his father. Special thanks to Cynthia for sharing her father's letters and photos. It's always good to read Dad's letters and get a feel for what he was feeling like. In the last letter he mentions Miss Creahan, his homeroom teacher. She was my math teacher when I was a sophomore and always treated me very well. Why is this set up so that we have to leave comments in a strange way? Thanks for sharing your story about your Dad's homeroom teacher, being your teacher too. As far as comments being set up in a strange way, I have it set up so I approve them before they post. You would be surprised how many strange and inappropriate posts I have to delete. Again, thanks for the comment, and we owe your dad, and those who served with him, a great debt, we can only repay by protecting what he fought for. thanks for sharing the letters and photos. my grandfather is in the group photo. Pfc. Wilder.